Legat Architects has created this rendering of the potential renovated front of Rock Island High School, using funds generated by the Rock Island County 1 percent sales tax for school facilities. More than $11 million has now flowed to Rock Island County schools for facility improvements in 1 percent sales tax funding. School administrators said the money is creating schools with better learning environments for students. Rock Island County voters approved the tax Nov. 8, 2016, after three failed attempts and adoption of similar sales tax in Scott, Henry and Mercer counties. Collections of the tax began in July 2017. As of September, the Regional Office of Education had distributed $11.6 million to 14 school districts. Disbursements are paid monthly, three months after Rock Island County shoppers pay sales tax on items. Districts got their first disbursement for facility projects in October 2017. In addition to the 10 school districts in Rock Island County, schools in Colona, Erie, Orion and Mercer County also received a portion of the 1 percent sales tax because some of their students reside in Rock Island County. Funding is based on student population, with Moline-Coal Valley receiving nearly $3.9 million. About a third of all Rock Island County students reside in the district. The Rock Island-Milan district, with about 30 percent of the county’s students, has received $3.4 million. The districts are wasting no time putting the new tax revenue to work. Many are completing long overdue repairs or new projects, such as heating and air conditioning, parking lots, building safety and LED lighting. Some districts, such as Silvis, are using a pay-as-you-go approach. Silvis, Superintendent Terri VandeWiele said the district has used the revenue to replace a water heater and 50-year-old doors at George O. Barr Elementary. The Moline-Coal Valley and United Township High School districts have used bonding to get major projects off the ground. Dave McDermott, Moline-Coal Valley chief financial officer, said districts legally can bond up to 80 percent of expected revenues. His district has bonded out for about $22 million in projects, with the bonds expected to be repaid in about nine years. The project list includes $15 million for HVAC and electrical at the high school, $3 million for the Bartlett Performing Arts Center, $2.5 million for heating and air as well as 21st Century learning projects at Franklin Elementary and $900,000 for LED lighting upgrades district-wide. McDermott said the projects are expected to be completed by the end of summer 2020. The following year, he said, the district may look to start a new slate of projects. United Township has borrowed $7 million for the $9.6 million student life renovation and addition project. Superintendent Jay Morrow said the work includes constructing a secure entrance, updating the library/media center, renovating the existing office complex and a student commons area. Future potential UTHS projects include roof replacements and HVAC and lighting upgrades. The new tax revenue, according to administrators, is creating real change for students and the community. Rock Island-Milan chief financial officer Bob Beckwith said his district has spent $1.6 million for a secure entry at Thomas Jefferson and roofing and tuckpoint work elsewhere in the district. This summer, the district plans $2.2 million for secure entries at Edison, Washington, Earl Hanson and Horace Mann. Rockridge Superintendent Perry Miller said his district has completed a new ceiling and LED lighting in the junior high wing. It’s also updated bathrooms at the high school and is making future plans. Riverdale Superintendent Ron Jacobs said his district has been able to climate control the high school and put a permanent surface on the parking lot between the elementary and high school buildings. Future sales tax receipts are planned to go toward secure entries renovating chemistry and biology labs a the high school. Ticking the these long-desired projects off the list, Jacobs said, has been amazing. It gives kids better learning opportunities they would not have had with outdated facilities, he said. Jacobs said taxpayers should know that “none of this money is going to be spent foolishly. “We appreciate every dollar we get, and it will help our kids and teachers in the classroom,” he said. Carbon Cliff-Barstow: Concrete repairs and buying new cafeteria tables, a new dishwasher and a new milk cooler. In progress are drainage system repairs. East Moline: All five school buildings were updated with new windows, LED lighting and air conditioning. Hampton: Air conditioning work, with roof repairs planned in the future. Sherrard: Paid off wind turbine bonds, bought a new phone system and installed new gym floor. In progress is a weight room and wrestling room addition at north end of high school. Colona: Building maintenance and repayment of capital improvement bonds to reduce property tax burden. Mercer County: Repaid existing health life safety bonds. Erie: Building a locker room/restroom facility at football/field track. Paul Kanakares. an electrician for the Tri-City Electric, works on the construction along River Drive, Wednesday, Nov. 7, 2018. You speak with Tri-City Electric’s Brian Vanderbleek and it’s clear the electrician/job foreman likes his job. Despite pay that would satisfy most appetites, Vanderbleek says there are a lot of job openings. “We can’t find enough people at the present time,” he said. “There’s a huge demand for it. He believes the reason is kids just don’t want to come out and do this kind of work anymore. Vanderbleek actually got his start working nights with Tri-City Electric. He liked the people he worked with and opted to go into the field, doing his apprenticeship with Art-O-Lite in Moline. “Then, when I got done there, I ended up coming over to Tri-City,” he said. What follows is a Q and A with Vanderbleek. A: I went through a five-year apprenticeship through the JATC, through IBEW Local 145. A: From apprenticehip at about $28,000 per year to over $100,000 for a longtime employee. Q: How hard is the work? A: We work really, really hard. Between pulling wire, running conduit, digging ditches, it’s manual labor. In the electrical field, we have a lot of mind work, where you have to do a lot of figuring of circuits and capacities and transformer sizes and conduit sizes. There’s a lot that goes into calculations what we do, a lot of math involved. Q: How about the safety aspect? A: The safety aspect is huge also. Between wearing harnesses, hard hats, safety glasses, you got to be careful what you are doing all the time. Electricity. You got to wear high-voltage gloves and medium voltage gloves. There’s a lot of stuff that’s involved with that. Electricity will kill you instantly. Q: Why is this work fulfilling? A: It’s fun to build stuff, and to see your end product is awesome. Q: Why did you go into this 27 years ago? A: I came out of high school and I was working part-time at Tri-City Electric at night, after school. I liked the guys worked there and I thought it would be a neat trade to go into. Editor’s Note: This is the first in an ongoing series on various careers. The Dispatch/Argus is profiling a career weekly in the Business Section. If you have an idea, please provide contact information, including name and phone number, and email jmeenan@qconline.com. Mark Gilmour, a local carpenter, sometimes wishes his son was as impressed with his work as he is. But the commercial builder for Allied Construction can take it in stride. He knows he’s proud of the job he’s done for 19 years, pleased with his pay and likes the feeling he has at the end of each day. The variety of work Gilmour has had in during nearly two decades on the job is part of what he likes most about being a union carpenter. “You do a lot of different things,” he says. And seeing what he’s had a hand in at the end of the day is satisfying. “Tangible work,” he says. Gilmour would definitely recommend the job to anyone considering it. “You get a professional qualified training at no cost to you,” Gilmour says. “You develop a skill set that is useful long-term. It’s a skill that will always be needed. People will always be building things. Apprenticeship/education:Four-year apprenticeship, one week a quarter, $50 for books per year, but book fee is given back if you complete the apprenticeship. And local carpenter Mark Gilmour notes, the program takes people with all levels of building experience. Pay: Apprentices make 60 percent of $29 per hour. Once done with that a carpenter can make $29 per hour plus the benefits. Benefits: annuity, pension, health care (including vision and dental). Toughest part of job:Dealing with the hot and cold. Can be physically demanding and require some heavy lifting. ROCK ISLAND — The main goal of the Junior Achievement High School Building Trades Career Expo is to open some eyes. About 400 high school students from 16 Quad-City and vicinity high schools will attend the two-day event that concludes Friday at the Plumbers & Pipefitters Training Center on the southeast edge of Rock Island. Students like Bettendorf senior John Eaton and Moline senior Elijah Roberson are exactly who the fair is meant for. Roberson said it opened his eyes to some opportunities about his possible future. Eaton said he learned about working in masonry, architecture, carpentry, ironworks and pipefitting. “About a month ago, I was thinking college was maybe what I want,” he said. In many ways, Eaton’s career thoughts reflect any generation: he wanted a fun career, with good pay that would make him happy. The expo has been going on for more than a decade, said Jerry Lack, executive director of the Tri-City Building and Construction Trades Council. His group and Junior Achievement put on the event every two years. He said the Tri-City Building and Construction Trades Council is happy to reach out to his school students anytime it can, especially juniors and seniors, who are on the verge of making their career decision. It exposes them to other career choices besides those that require college. “It makes me think about my career choices in the future,” said Ulrich Rush, a Moline High School sophomore. Careers that piqued his interest included working with cranes and cement masonry. “It seems interesting,” he said. Dawson Kirst, also an MHS sophomore, admitted he was happy just to be out of school for a while. He was already considering going into a trade upon completion of high school. He learned something Thursday, too. “It’s good money for good work,” he said. Getting students’ attention about career choices is part of the effort over the two days. “The whole event is really to introduce career options in the building and trades to the students,” said Tawnya Hambly, senior director of marketing and special events for Junior Achievement. Trade coordinators in various areas tell the students what skills and aptitudes are needed and what they could be doing in high school to prepare for a career in a trade. Students got a chance to do some plastering and welding Thursday. Students are shocked at the pay, including that some in the trades eventually earn as much as $100,000 annually, Lack said. Cody Mueller, who worked with students, teaching them some basic plastering, was hoping to see if any of the students liked the movements required in his trade. A third-year plasterer apprentice, Mueller wishes they had such an expo when he attended Davenport North. “It opens them up to more than just one set trade or college,” he said. Ironworkers work on the IH Mississippi Valley Credit Union Headquarters on Sept. 20 in Moline. 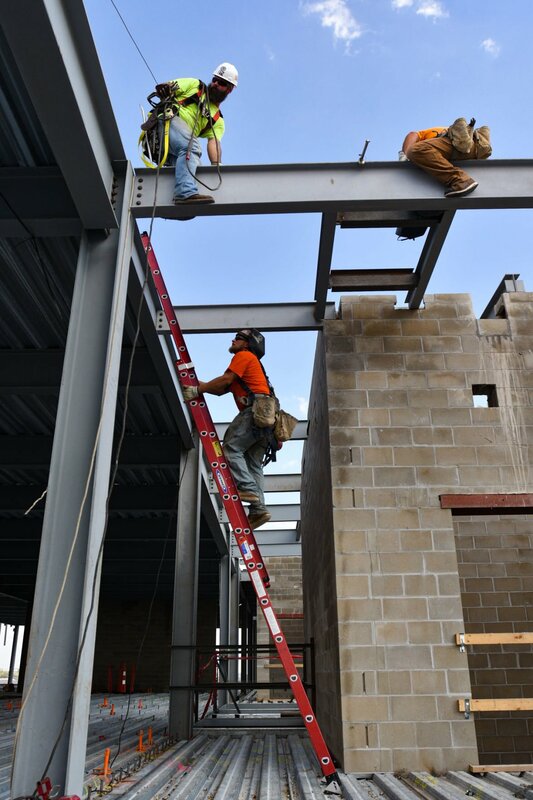 Ironworkers work on the IH Mississippi Valley Credit Union Headquarters last month in Moline. Jason Caldwell remembers his start as an ironworker some 26 years ago. He was simply looking for a construction job, ideally one with a trade. So he applied for an ironworker’s apprenticeship. More than two decades later he does not regret it. You can easily see something new every day, he added while noting it’s often great to work outside. Ironworkers can be found working at the IH Mississippi Valley Credit Union’s new building on River Drive in Moline, or on the new bridge, where about 100 work in things like cofferdams, which are the rectangular beams one sees sticking out of the river. Water is pumped out so ironworkers can do their work on the bridge’s foundation. Though Caldwell considers working outside a plus, the extreme heat or cold, he admits, is a negative to the job. Being a worker who is represented by a union is a plus, he said. Another plus is the people he works with. Safety on the job has improved during his career. The top concern of contractors is employee safety, he said. Teamwork in terms of safety, is another positive, he said. There’s an actual shortage of ironworkers currently, Caldwell said. About the only drawback to the work is once the building or bridge is constructed, the ironworkers’ work is hidden.